Every day we are tempted. What are we tempted by? Are you tempted by kale? Tofu? Quinoa? Are you tempted by Lay’s? M and M’s? Cookies? What are you tempted by? From the lure of the forbidden cookie jar to the dark sites on the Internet, from the gossip we long to share to the grudge we desire to nurse—our minds are not at peace. We’re at war with Satan, with a sinful world, and with ourselves. You are not alone in your battle. Fresh from His Baptism at the Jordan, Jesus was driven by the Holy Spirit into the wilderness to be tempted. Jesus, your brother, and your God, knows temptation. Even better, He endured it without a single sin. He never succumbed, if you will. Best of all, He gives you His victory, as James explains in today’s Epistle. In Jesus Christ, the Crown of Life Is Yours. Our battle against temptation is underway—and it is going on every day (vv 13–16). Why are we in this daily battle? Is God tempting us? James says, “No way!” You may be wondering why James would even bring this up. The reason is there were rabbis in James’s day, and some religious folks today, that teach that God is the author of temptation and evil. I read about a rabbi in Michigan who has written a new book that argues that the first sexual assault was Eve being assaulted by God in the Garden of Eden. That is flat out wrong! Absolutely not! God tempts no one (v 13). It says so right here. The Bible tells us the first temptation came from the lies of the spiritual terrorist we refer to as Satan, directed to Eve in the Garden. Every moment we are awake, Satan is trying to get us to do the opposite of what God wants us to do. It stinks. I hate it. But that’s the way it’s been since Adam and Eve blew up paradise. Our troubles, though, are not just from Satan. Verse 14 of our text also tells us that we are tempting us. “…each person is tempted when he is lured…by his own desire.” When it comes to sources of temptation and evil, Luther talked about “The devil, the world, and our sinful flesh.” If you remember your catechism, Luther uses that phrase a lot. Satan tempts us. People tempt us. But we also tempt ourselves. That last one means the buck stops with us. The Rev. Flip Wilson, you have to be my age or older to get this one, taught us “The devil made me do it!” It doesn’t work that way. Like Adam after his fall, we like to blame others for our sin. But it doesn’t work. We try to shift the blame to others for our temptation and sin: It’s the fault of my parents, my poverty, my wealth, my youth, or my bad health. Society’s to blame! It’s Trump’s fault! It’s fake news! It’s the media’s fault! They’re to blame, not me. We try and get away with that. But it doesn’t work. 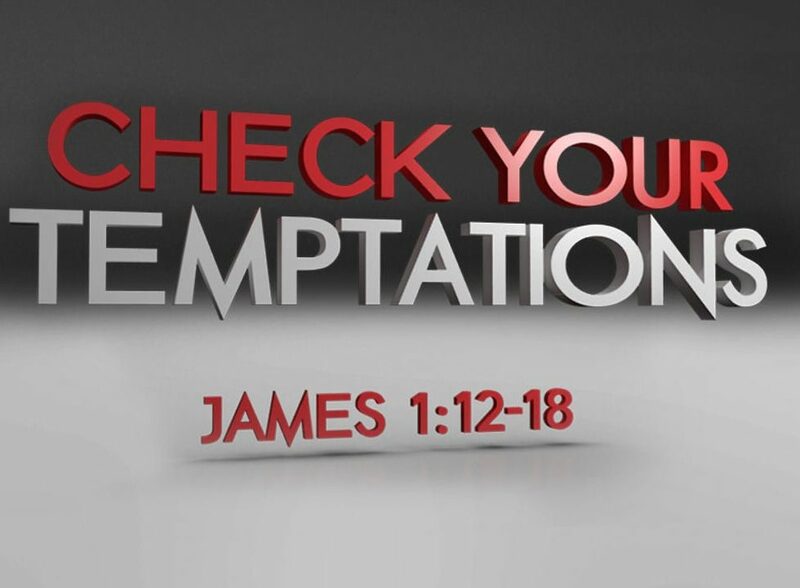 James writes, “Each person is tempted when he is lured and enticed by his own desire” (v 14). Jesus taught this, too. Jesus said that the desire to sin begins in our own hearts and minds. Mt 15:19, “For out of the heart come evil thoughts. . . .” Then He lists some of the bad things we do: murder, adultery, sexual immorality, stealing, lying, slander. The Devil tempts us. But we also tempt ourselves. Now maybe you ask the question, “Is temptation really that big a deal?” Yeah, because death is the result. James tells the awful consequences of letting our sinful desires lure us: “Then desire when it has conceived gives birth to sin, and sin when it is fully grown, brings forth death” (v 15). Temptation leads to sin, “the wages of sin is death,” and death means hell. (David) We have to stop lying to ourselves. James said it, “Do not be deceived” (v 16). Instead, we have to get out of that “Blame everything else” garbage and start repenting of our excuses, our blame, our sin, and our sinful desires. But let’s not forget the Good News. Jesus Christ overcomes temptation, sin, and death to give us the Father’s good gifts. Remember what we had at the end of the Epistle today. James reminds us that God is constant. The Father of lights never changes (v 17). He created the sun, the moon, and the stars, and we would say they are reliable, right? More reliable, certainly, than a ballplayer who SWEARS he has never used steroids or the politician who says you can keep your doctor or the promise of a girl as they break up with you that “We’ll always be friends.” The sun rising is pretty reliable. But He is even more reliable. His love, Grace, and Mercy are VERY reliable. We are also reminded here this morning that the Father constantly delivers good and perfect gifts, especially His Son, who came down from the Father of lights. I love it when a pizza, or a case of Sprecher root beer, is delivered to my door. Have you noticed there are now, like, a dozen ways to get your favorite restaurant stuff delivered to your house? UberEats, Door Dash, 858 To Go, Grub Hub. Well, our Heavenly Father delivered Jesus to us. He was “delivered” in Bethlehem. In Jesus’ wilderness journey, we see the perfect gift of His sinless life. Jesus came here to take our place, to fulfill the law for us, and live the perfect life for us, and then take our punishment on His shoulders. In the Old Testament lesson where God commanded Abraham to sacrifice Isaac and the ram’s death in his place, the Father foreshadowed His Son as our sacrifice—the good and perfect death, going through the death we owe for our sin (Gen 22:1–18). But the Good News does not end there. It isn’t enough that Jesus was sinless. Jesus died and rose for you! God delivers more than Jesus. The Heavenly Father gives you new life in Christ (v 18). By the Word of truth, the Gospel, you are born into a new life. The perfect life of Christ has now been given to you! I mean think about it, what’s the best thing you were ever given? A ring? A car? One Christmas Erica got me a new subwoofer. Now that’s love, right? How about a perfect life! Life in heaven! God gives you what Jesus won when He defeated the devil by rising from the dead on Easter Sunday. He continues to feed and sustain your life in Christ by giving you every perfect gift: His Word, Christ’s body and blood, and finally, getting to go from this broken world to heaven. The ultimate gift of the Father through Christ, then, is the crown of life (v 12). So boys and girls, what have we learned about temptation today? It stinks. We do not usually do well against temptation. Did you dive right into that kale? No? What about the chips or the cookies? Jesus taught us to pray, “Lead us not into temptation, but deliver us from evil.” The First Sunday in Lent reminds us of our daily struggle with our daily enemies—evil and temptation, Satan and sin. We should not ever forget that we are at war against lethal spiritual terrorists. We are told: “Put on the whole armor of God, that you may be able to stand against the schemes of the devil” The daily battle against temptation and our many losses are deeply discouraging but do not lose heart. Jesus has defeated the bullies for us. He paid our debt. He lived without sin. He put Satan in his place. Jesus won, but He gives His people the victory, the crown of life.